DAVROS: Already I have seen them sacrifice today, for their beloved Doctor. The Earth woman who fell opening the Subwave Network. DAVROS: How many more? Just think. How many have died in your name? The Doctor. The man who keeps running, never looking back because he dare not, out of shame. This is my final victory, Doctor. I have shown you yourself. Recently, I watched the 2005 Doctor Who series again, from scratch, with Thomas keeping me company. It’s aged surprisingly well. It’s New Who before it got bogged down with needless homages to the past. At the time, Davies’ umbilical snipping annoyed me; it felt as if – through the Time War – he was stomping all over the legacy of the show and then turning it into a soap opera. These days it’s more apparent than ever that this is exactly what he was doing, but it bothers me less. Instead, I concentrate on the good things: the actually-quite-reasonable special effects, the decently-paced storytelling, some pretty creepy aliens (if you don’t get a chill when that phone rings and Noah Johnson’s voice cries “Muuuummmy….”, or when Richard Wilson grows a gas mask through his face, there’s something wrong with you) and even John Barrowman. I know that ‘Jazz Hands Jack’ wore out his welcome long before the fourth series of Torchwood, yet I still love him. And I always will. But there’s something about that Ninth Doctor, and it’s a recurring trend. Basically, he’s a bit crap. 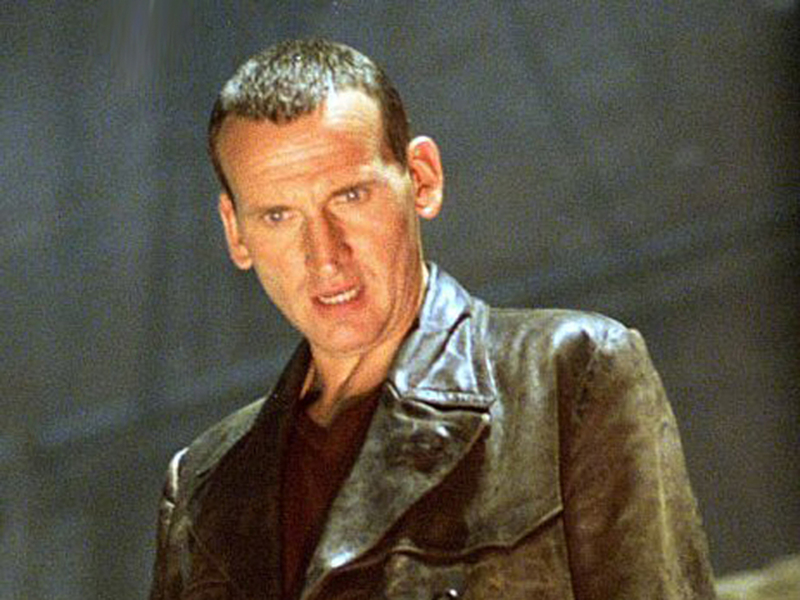 Part of the problem is Eccleston’s brief tenure in the leather jacket. Davies’ first series as chief writer establishes the Doctor as a broken, violent figure whose ultimate redemption begins when he refuses to kill one Dalek and ends when he refuses to kill a million of them. It’s ironic that one of the final scenes in this first series features the Doctor not watching television in a London council estate but on the floor of a colossal space station, assembling things out of wires and circuit boards and arguably looking seriously Doctorish for the first time since Paul McGann got out his jelly babies. Had Eccleston not jumped ship when he did, the next series would have undoubtedly seen a more confident, self-assured Time Lord stomping around the universe with Rose and saving the day far more than he actually does in this series. Not entirely useless, but too little and too late. 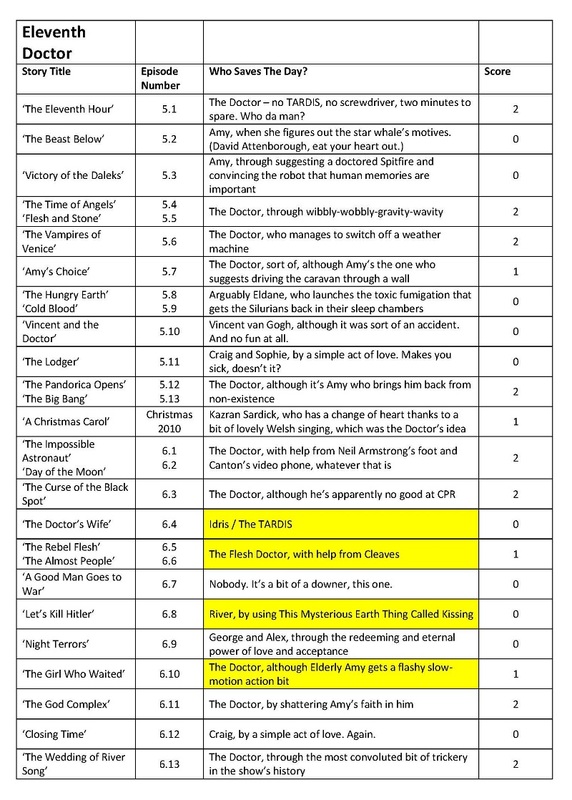 That notion of ‘saving the day’ is what drives today’s entry, because for a while now I’ve been compiling a list of every episode in the New Who TV canon, with the intent of determining each Doctor’s relative usefulness. Because if you actually look at Doctor Who in its post-revival years, what you find is a show that’s far less about an ageing Time Lord saving the universe, and far more about his companions doing it for him. There’s far less trickery with wires and exploding shuttles, and far more eleventh hour reprieves, conveniently placed Chekhov’s guns, and more than a few supreme sacrifices. None of this is new to the show. One of my favourite Classic Who stories, ‘The Ark In Space’, ends with not one but two sacrificial suicides from members of the crew. ‘Earthshock’ saw Adric destroy the Cybermen at the cost of his own life. And then there’s poor old Katarina. But it’s telling that in the ‘Death of a Companion’ section in the companions Wikipedia entry, over half those listed are from New Who. Acts of self-sacrifice – as opposed to pointless deaths, which Classic Who had in abundance – abound in the post-revival era, whether permanent (supporting characters), temporary (Jack) or silly (anything involving Rory). It’s almost as if they’re put in on purpose with the intention of building to one last Montage of Demise, which is precisely what we see while Davros is monologuing during the scene I quoted at the beginning of this post. I could just about believe that, if I also believed that Davies was capable of thinking this far ahead. But all this got me thinking. Besides the suicides, there are plenty of examples where the Doctor is in a fix and only his companion is able to save him, presumably as part of the now-milked-to-death “companion identification” ethos that the show has tried so hard to promote for decades, but particularly since 2005. We can’t identify with the Doctor, we’re told, so we must therefore identify with his companions. This means making them spirited, independent and likeable (well, one out of three, Martha). Oh, and feisty. Mustn’t forget feisty. They must appeal to the lowest common denominator by being young and pretty because that’s the only way that we’re going to like them. Again, none of this is exactly new (cf. Susan, Leela, Peri, Mel) but it’s fair to say that New Who has over-egged the pudding. 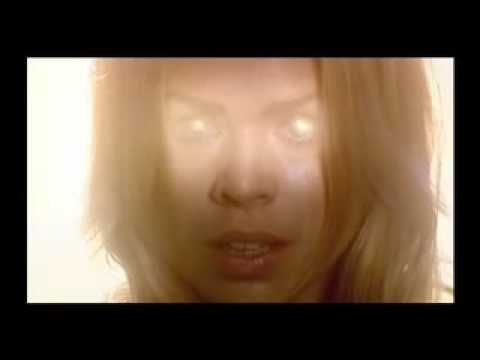 It wouldn’t be a problem except that the show now works tremendously hard at building up audience identification for each companion before completely undoing it by turning them into blank-eyed gods, giving them Time Lord mindsets, reincarnating them across the entirety of time and space, or resurrecting them from the dead on a weekly basis. In other words, if you’re a companion and the universe has to revolve around you, it’s going to be hard for people to empathise. 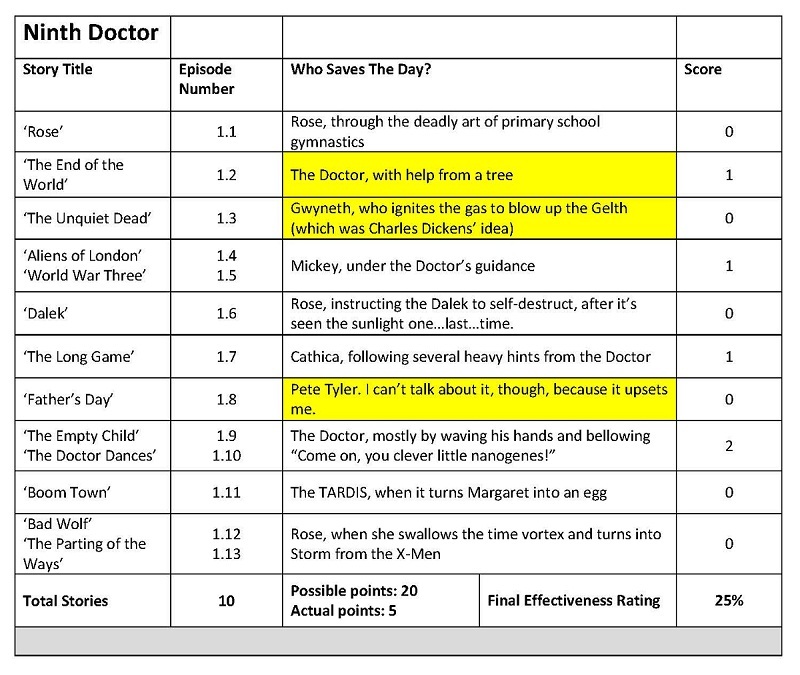 I then tallied up the total points that each Doctor accumulated, and divided that by the number of points they could have accumulated if they’d been on top form throughout the series, and from this we get a final ‘effectiveness rating’. 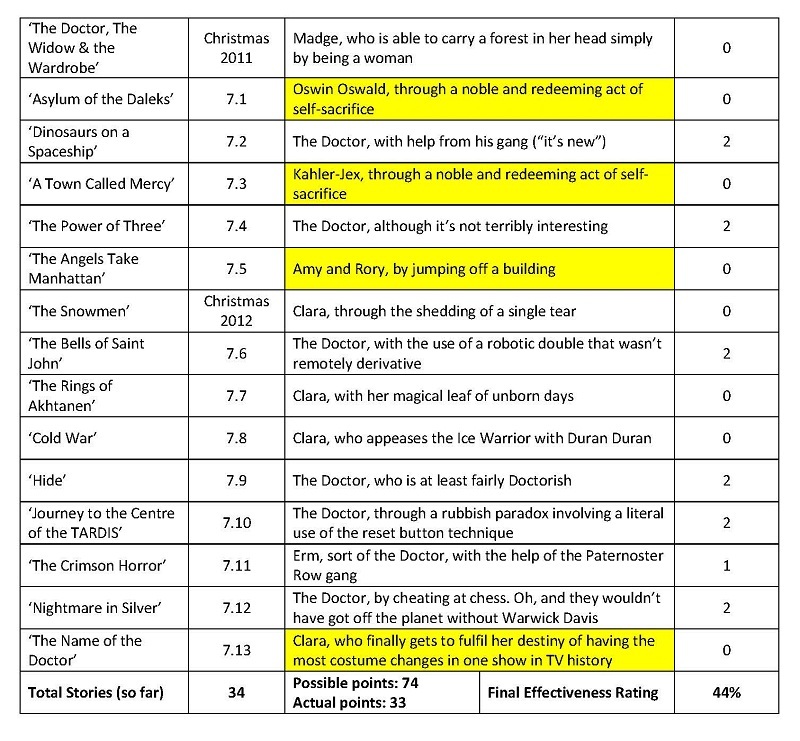 So an unassisted, triumphant Doctor who’d starred in thirty stories would amass sixty points. And so on. Note that ‘saving the day’ is ambiguous. For one thing, the term itself may refer to the salvation of five or six people (or even fewer), or the entire universe – in each case I put in whatever the thrust of that week’s narrative happened to be. Furthermore, these narrative thrusts only apply to climactic events – cancelling the bomb, appeasing the wrathful deity, or destroying the Daleks. 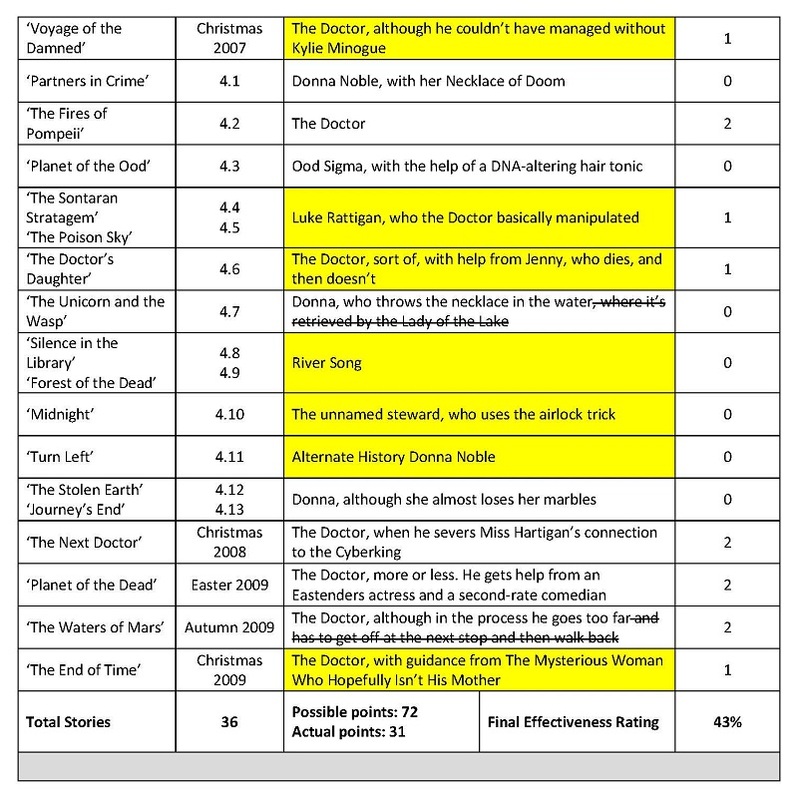 These may be events in which the Doctor plays only a small part, but it would be unfair to say that he is ever actually useless during a story, with the possible exception of ‘The Angels Take Manhattan’. Even in a tale like ‘Midnight’, in which the Doctor spends most of the narrative out of his depth and surrounded by people who fear and distrust him, he is able to use his influence (and another plant and payoff) to convince the steward to do the right thing, and the Doctor’s moral imprint upon events is felt long after she blows Lesley Sharp out of the airlock. It’s not a perfect system. For example, if the Doctor has an idea but gets someone else to do it, because he’s otherwise engaged (cf. ‘The Age of Steel’, below, he gets only one point. Some of you may find this unfair. I call it my system of scoring, and I’m the one who put this together, so tough. And with that in mind, I hope the scoring is at least relatively consistent. Let’s see how we get on, shall we? Ninth first. 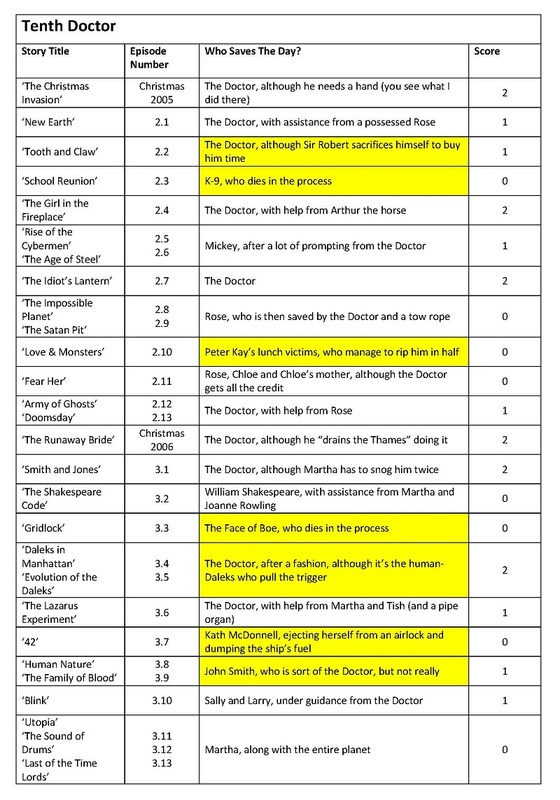 Oh, and important point: acts of sacrifice, excepting those of the Doctor himself, are highlighted in yellow. Oh dear. It really doesn’t look good for poor Chris. But as I said earlier, I don’t think it’s his fault. The first series of New Who was very much about bringing the Doctor back from the brink, and I’m sure we’d have seen another side to him if Eccleston had lingered. Now, this is interesting, particularly when you compare it to the Eleventh (below). He’s a little more effective than his predecessor, but look at how many stories involved sacrifice – fourteen out of thirty-six, which is over a third. This is almost certainly connected to Tennant’s ability to look appalled and shout “NO!” to BAFTA-winning standards, but no wonder Davros was gloating. Fewer sacrifices, but lots of ‘null points’. And yes, I’m aware that this will need updating again in December when he goes all golden and Christ-like, in another overt display of religious symbolism. Even with two more sets of full marks (unlikely given that November’s instalment also stars Tennant and will probably end with Hurt doing something redemptive and heroic) he’ll be hard pressed to leave any sort of real distinction. But that can wait. In the meantime I’m off to watch tonight’s episode: ‘Gridlock’, in which the Doctor witnesses the overdue demise of a character with a massive head. And for a change, I’m not talking about the chief writer. Yes, but you can’t expect to wield supreme executive power just because some watery tart threw a sword at you. If I went ’round sayin’ I was emperor cos some moistened bint’d lobbed a scimitar at me, they’d PUT ME AWAY!